The lack of full-time employees on campaign disclosure forms doesn't mean the campaign isn't staffed, but rather that it is being staffed through contractors who, like employees, are paid regularly. 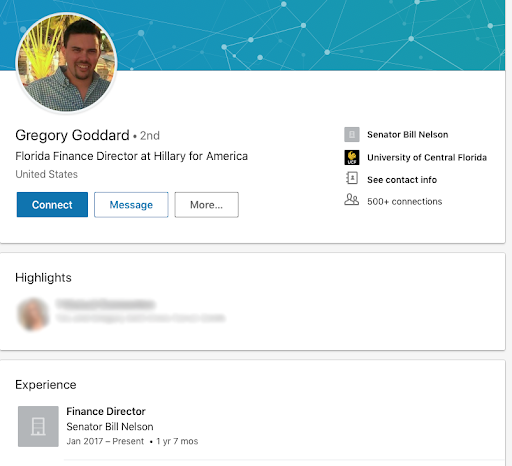 Gregory Goddard, who on his LinkedIn page says he's been the Nelson campaign's finance director since January 2017, has received regular payments from the campaign since the beginning of the cycle for his work as a "fundraising consultant." 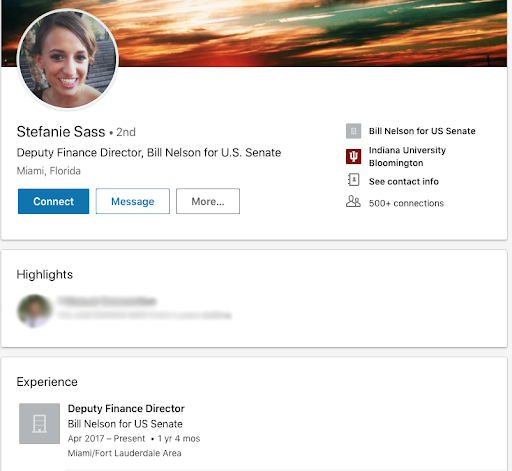 Marissa Tully, who refers to herself as a finance director for the Nelson campaign on her LinkedIn page, has received regular payments by the campaign since March 2017 for her work as a "fundraising consultant." 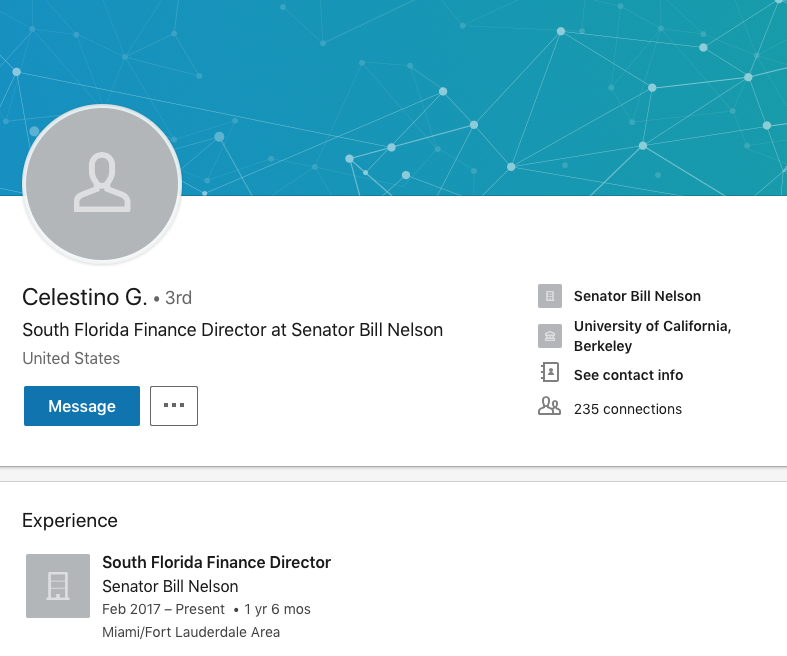 Payments to "fundraising consultants" have been disbursed in the same manner to the campaign's deputy finance director Stephanie Sass, deputy national finance director Daniel Cooper, and south Florida finance director Celestino Garcia. Regular payments are also made to a "research consultant" and "compliance consultant." A campaign finance expert who discussed Nelson's disclosure with the Washington Free Beacon called the structure "completely uncommon." "Campaigns do have tons of contractors, that's not uncommon, what's completely uncommon is to have no employees," the expert said. The campaign filings of Nelson's fellow incumbent Democrats running in tight races back up the claim. A review of filings this cycle for 10 other Democrat reelection campaigns—senators Claire McCaskill (Mo. ), Joe Manchin (W.V. ), Joe Donnelly (Ind. ), Heidi Heitkamp (N.D.), Tammy Baldwin (Wis.), Jon Tester (Mont. ), Sherrod Brown (Ohio), Debbie Stabenow (Mich.), Bob Casey (Pa.), and Bob Menendez (N.J.)—found Nelson to be the odd man out. Each of the 10 campaigns disclosed payments to salaried workers as well as the costs associated with them, such as payroll taxes and payroll processing fees. Each campaign also discloses payments to health care companies such as United Healthcare to pay for their employees' insurance—Casey's Pennsylvania campaign appears to provide dental coverage as well. Payroll costs add up. The McCaskill campaign, for example, has thus far this cycle spent $38,444 on health insurance and $256,441 in payroll tax. Florida governor Rick Scott, Nelson's likely Republican opponent in November, launched his campaign during the most recent cycle and won't provide his first filing until later this month. His campaign, however, tells the Washington Free Beacon it has salaried employees, provides them health insurance, and pays payroll tax. The Nelson campaign did not make itself available for an interview by press time. 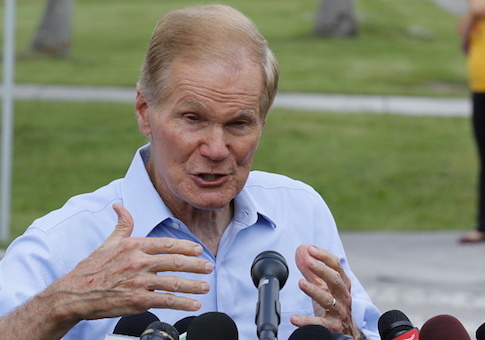 Campaign veterans say it is "highly unlikely" that the campaign has been able to operate this long without employees, raising questions of whether Nelson's campaign has been skirting federal labor laws by categorizing his workers as contractors. "The IRS sets the regulations that determine whether somebody is an employee or a contractor," the expert said. 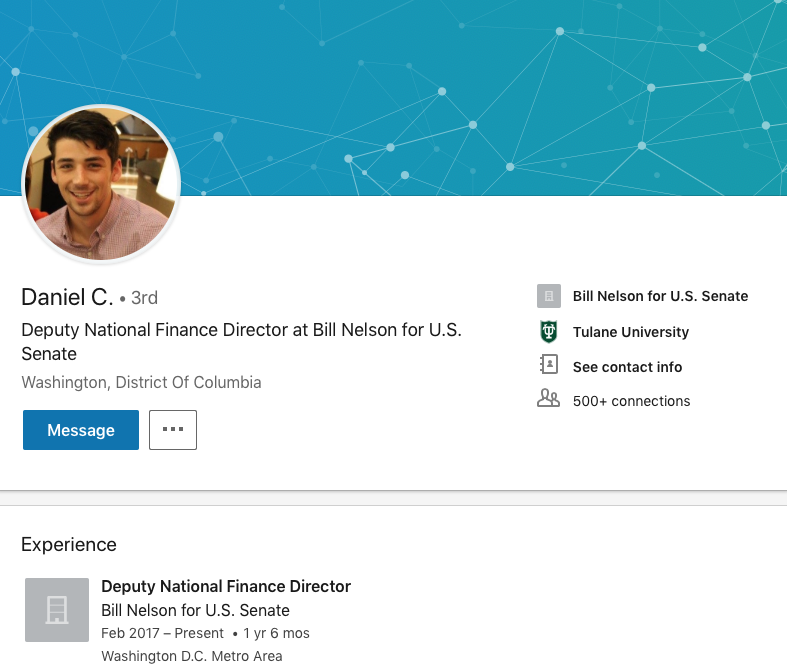 "If these folks are taking direction from the Nelson campaign or using campaign property by working out of campaign headquarters, these are the facts the IRS uses to determine whether somebody should be treated as an employee or contractor." A veteran campaign election lawyer said it would be "theoretically" possible to run a campaign using only contractors, but it would be impractical, especially in Florida. 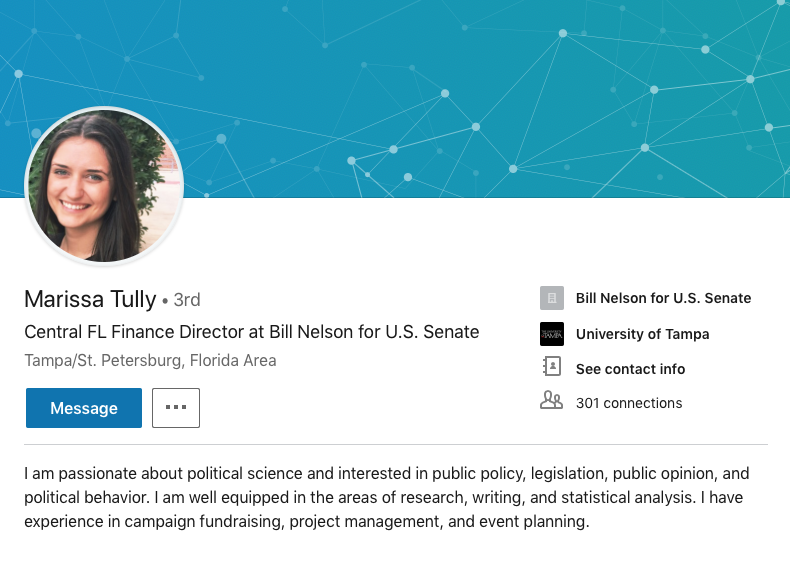 "You could theoretically run your entire campaign with independent contractors, but it's very unusual and impractical, especially for a statewide race in Florida," the lawyer said, pointing out the difficulty for low- or even midlevel staffers to operate as contractors. The lawyer also raised the possibility that federal labor laws were being violated. "If you really act like a full-time employee, you can't just call yourself a contractor as a way to skirt requirements of federal labor law," the lawyer said. The practice of classifying workers as contractors has drawn the ire of high profile Democrats in the past, including Ohio senator Sherrod Brown (D.), who is up for reelection and buys his campaign staff's health care through the government's Small Business Health Options Program (SHOP). After a Cleveland Plain Dealer investigation found that Ohio Democrats such as former representative Dennis Kucinich and Rep. Marcy Kaptur were treating staff as independent contractors rather than employees, Brown called for legislation to make it harder to bypass tax obligations with the tactic. "Pretending employees are independent contractors in order to avoid paying taxes robs hardworking Ohioans of the benefits they deserve and undermines employers who play by the rules," Brown said in 2011. Former senator Harry Reid (D., Nev.) criticized his 2010 opponent Sharron Angle for the practice, calling it "a way to get around having to pay taxes and provide benefits for your employees." Payroll taxes are the second largest source of government revenue, according to the Tax Foundation. Money brought in through the tax is largely used to fund Social Security and Medicare, programs Nelson has pledged to protect. Nelson has also been supportive of the Affordable Care Act's employer mandate, which required employees to provide health insurance for employees, voting against legislation to remove it from Obamacare. The Campaign Workers Guild, which advances the idea of unionized campaign staff, has criticized the Democratic Party for being hypocritical on labor issues because of its treatment of campaign workers. "The Democratic Party, in particular, is a champion of labor rights, except where its own laborers are concerned. Campaign workers routinely work more than twice the standard workweek for less than minimum wage and no health care benefits," the group says. "It's time for our employers to live up to the values they publicly espouse."